Moyle’s confusion was understandable. In the second half of the twentieth century, as DuPont’s Textile Fibers Department sought applications for their new synthetic fabrics, they often looked to the outdoor industry. Clothing companies that sold gear to hikers, campers, and climbers were interested in the qualities of synthetics such as Dacron and Polypropylene. 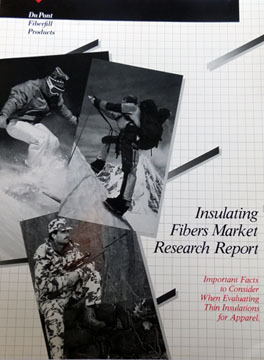 DuPont helped stimulate this interest by advertising their materials directly in outdoor lifestyle magazines like Field and Stream and Backpacker. These advertisements sold the concept of synthetic materials, but not an actual product. Consumers like Moyle could leaf through a Field and Stream catalog and learn about Dacron—“It’s warm, It’s light, It’s comfortable, It’s quick drying.” It was then up to the consumer to go looking in a brick and mortar store like Recreational Equipment, Incorporated (REI) or a catalog like Duxbak’s for the latest in outdoor synthetic materials. 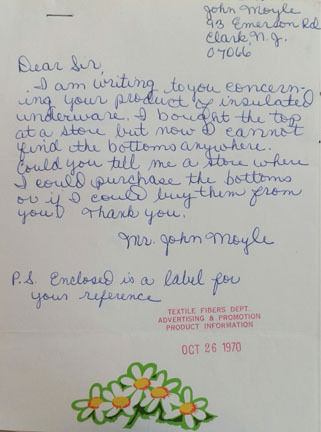 Moyle’s letter was not the first time DuPont’s Product Information representative received a request for clothing. This was good news for DuPont, as subsequent market research reports confirmed—registered trademarks had brand recognition. 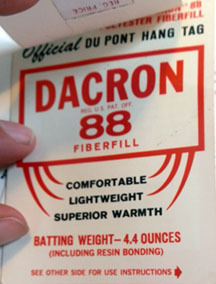 Moyle looked for Dacron Fiberfill insulated products as a result of careful, directed advertising meant to raise the profile of DuPont innovations. Indeed, Moyle’s instinct to write to the chemical giant rather than Duxbak, the actually producer of his shirt, shows the success of DuPont’s branding efforts. Just like John Moyle, I got a lesson in how DuPont ran its business during my dissertation research at the Hagley Museum and Library. Catalogs and magazines since the 1970s have runs ads from Du Pont, 3M, and other companies pushing their high-tech innovations. It was only when I came to the Hagley and examined the DuPont textile fibers collection that I understood why those advertisement existed, and how they operated for consumers like John Moyle.